Miniature and robust, this single channel connector is ideally suited for applications requiring a single high-performance transmission in extreme environments such as in aerospace and military equipment. 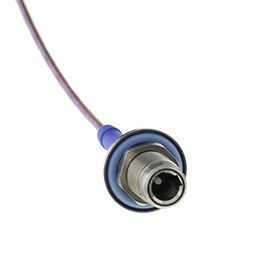 Specifically designed to be compatible with the industry standard LuxCis® ARINC 801 fiber optic contact, the LxC-R® is qualified to withstand high levels of vibrations and shocks. The flexibility of the LuxCis® ARINC 801 contact allows the use of either MultiMode or SingleMode fibers for both PC and APC terminations. The LxC-R® product range includes plugs, square flange and jam nut receptacles, as well as hermetic configurations.